WHEN Gus Doyle first set eyes on tiny Osborne she knew he was special. And with her love and devotion he would go on to change lives when he gets one of the most important jobs a dog can have. The dog-lover signed up to become a volunteer puppy parent for assistance dog charity Canine Partners’ Essex group in May 2009 and was asked to care for Osborne. Now her first pup has grown up, flown the nest and graduated as a fully-trained assistance dog. The six-year-old pooch now lives with his best friend a Glyn Jones, 71, from West Sussex, who has MS and helps him with tasks including picking up anything he drops, opening doors and fetching help in an emergency, boosting his independence. But Osborne began learning his life-changing tasks when he was a puppy living with Gus. The 74-year-old from Bishop’s Stortford, in Hertfordshire, spent 13-months teaching him the basic skills he needed for his important job while ensuring he was always well-behaved. She took him on busses and trains and visited supermarkets, cafes, restaurants, shopping centres, parks, banks, clubs and even took him to Church on Sundays. And they made sure they met lots of other people and animals. Gus and Osborne also attended puppy training classes and had home visits from Essex satellite trainer Emily Lawrence who gave her guidance on the charity’s reward-based training techniques, praising the puppy and giving it lots of treats, toys and playtime when they get something right. 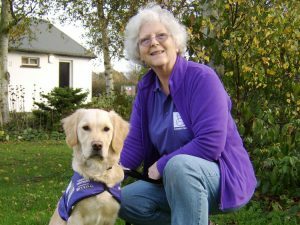 Then when he was 15-months-old he left Gus to begin his advanced training at Canine Partners’ southern training centre in West Sussex where he developed the skills he had learnt with his puppy parent. It was there that he met Glyn and the two of them have been inseparable ever since. Gus, a mum-of-two, said: “After I retired I felt I needed something to get my teeth into. I saw an advert calling for puppy parents at the Canine Partners’ satellite training centre in Chelmsford and I thought this would be ideal. “It meant I could have a dog around the house again while also indirectly helping someone who needed it. And I haven’t looked back. “It’s extremely special when you see this small, energetic, playful and soft being with that unique puppy smell, turn into a beautiful well-behaved and obedient dog. “It brings a sense of achievement when I get to the end of my role as puppy parent and the dog passes onto the next stage of their training and eventually goes on to make such a huge difference to disabled peoples’ lives. “I cannot imagine anything worse than getting an illness that gradually worsens, or breaking my back and no longer being able to walk or you losing limbs fighting in a war. Whatever I’ve gone through in my life is nothing compared with these situations and if I can bring just a tiny bit of help to someone then this is what I have to do. It drives me on. “People say they would struggle to give the dog up when it’s time for them to move on to their next stage of training. But for some reason it’s not difficult for me, maybe because I always know that I only have them for a few months. “What I find more emotional is waiting to hear whether they’ve passed their assessments to become an assistance dog. “You’ve got to think that there is somebody out there who needs some companionship or some help with their day to day lives. But Gus, Osborne and Glyn have stayed in touch and built a strong friendship. Glyn said: “I became friends with Gus from the moment Osborne came into my life. She has stayed in touch and when she visits, he always remembers her. “I thought it was important that Gus remained a part of Osborne’s life and I’m grateful to her for everything she has done to make Osborne the fantastic dog he is. “He has changed my life. The things he does for me save my energy for him. I laugh and cry everyday with happiness. From when I wake in the morning, to when I go to bed Osborne is there for me. Gus has now looked after five puppies for Canine Partners including Yardley, Oreo, Freya and Astrid. Now, as she prepares for her sixth puppy, she is calling for more people to sign up and become volunteer puppy parents which are urgently needed by the charity so that they can train even more life-changing dogs. Gus added: “Without puppy parents Canine Partners cannot continue training assistance dogs. For more information or to apply call 08456 580 480, email info@caninepartners.org.uk or visit caninepartners.org.uk/puppyparents. The West Country’s cleverest pups want you to come to their party!